As far as white tablecloth restaurants go, this simple wine and butter sauce is probably made more often than any other sauce recipe. The wine can be red, white, or blush (we used to call it rosé back when no one liked it), and the technique has basically remained unchanged since it burst onto the culinary landscape during the “Nouvelle” cuisine movement of the1970s. Nouvelle cuisine is French for "new cuisine." This style was a reaction to the classic “Haute” cuisine ("high cooking"). It focused on lighter, and more delicate dishes, without the traditional, heavy, flour-based sauces. 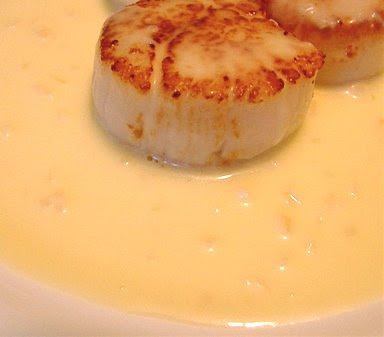 One of the darlings of this new style was a butter sauce called “beurre blanc,” a simple reduction of wine and vinegar, finished with whole butter. This sauce is incredibly versatile, and very simple to make. 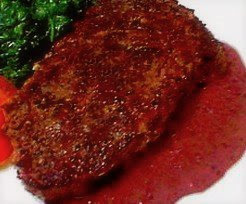 Below this beurre blanc video recipe is another version that uses red wine, called "beurre rouge." It's a pretty old clip that I posted last year, so it's a little rough around the technical edges. Here's the link in case you want to read the original recipe, and get the ingredient list. Enjoy! UPDATE: CLICK HERE TO WATCH VIDEO! I like the recipe. Thanks for sharing the recipe. Thanks for the recipe. Could I use lemon juice instead of vinegar? Can the beurre blanc keep in the refrigerator to be used later or does it have to be used when made? Made this last night with some scallops (per the pic). Delicious. I usually double sauce recipes when making them as I find myself always wanting more (no, I'm not one that likes to drown my food in sauces. But... well... maybe I do...) Anyways, I doubled it and boy is my cardiologist happy. Waaaay to much for anyone who wants to live past 40 years old. Just follow Chef John amounts and you'll be happy. I would also play with the acids too. I think I added a touch too much vinegar. Some lemon juice sounds like a good idea. As for it keeping, I concur. It's butter, and you'll be reminded of that the next day when you try and "resurrect" it. Make it and enjoy it fresh and thank Chef John that you did. Thanks. Yes, a little goes a long way. Many chefs will only put a few tablespoons per plate due to the rich/sharp flavor. Experiment away! as a wine noob could you recomend a good red wine for the beurre rouge,coq au vin and a good white one for the beurre blanc? Almost any $10 Cabernet will work for the first 2, and I like a nice Sauvignon Blanc for the BB. How aout a serious clip on Prime Rib, or Standng Rib Roast. And if possible, please cover what to o with lf overs, mening how to re heat it wthout loosing quality and the rearness and colour? My budget's a little tight for a Prime rib! Maybe I'll get a big donation and then I can do it. There's really not a good way to reheat with losing some color and juice. Best for sandwiches! what does it mean for a sauce to 'break'? Chef John: I want to thank you sincerely for these excellent recipes and instructional videos. I enjoy your witty use of humor that makes cooking a little less scary. There are a few recipes that prior to your videos, I would not have really tried. I look forward to more of your instructional videos and browsing your site. Your a hoot. I will check you out again, gotta try the scallops. They are calling my name. The beurre blanc video is no longer there, where can i watch it? The beurre blanc video is no longer available. Is there anywhere i can watch it? okay, see new link to video!